As some of you might remember, last year I described the beautiful garden on the roof of BMC, administered by The Food Project. Since then, I've been learning about Green Roofs overall. And so, it seems, has Boston, even the Natick mall is onboard with plans for a green roof well underway. 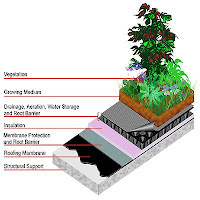 In places with extreme temperatures, green roofs generally mean less cooling is needed in the summer, and less heating is needed in the winter. If set up correctly, they actually lengthen the lifetime of the roof significantly. And if you can't afford to formally set up the entire space as a green roof, you can also use large pots, or even kid's paddling pools, as a means of creating a green space on top of the world. It seems elegantly simple: the heat that used to make summer unbearable is now used for photosynthesis. It's essentially turned into heat that you can eat. Wellesley grads/current students, have you ever ventured to the roof of the science center? I keep on thinking about that space and how it could be used for growth. Of course, Wellesley does not have the same space issues that the city of Boston has, but with all the incredible scientists (and plant physiologists) there seems to be an opportunity to turn an energy disaster (how much must it cost to heat all that empty space in the Focus?!) into a space of innovation and research. Planting Green Roofs and Living Walls by Nigel Dunnett and Noel Kingsbury is a great resource for thinking about how to plant and green your lives. They explain Green roofs without focusing on food production, but rather on creating architecture that is consistent with an existing landscape, rather than in opposition to it. It gives wonderful technical insight into how you could actually do this in a way that keeps your plants alive for the long term, and keeps your roof strong. As for me, though, I'm really interested in roofs as a potential space for food production. In American cities, the poor (and, to an extent, the rich) eat food that is damaging to their health. I can attest to the fact that produce just doesn't taste the same in the U.S., as compared to South Africa. Empowering individuals in apartments in even the most urban of urban areas means that food production is no longer outside of the hands of the people who want to eat well. Having food in spaces that are accessible and safe (on the rooftops of residents' buildings, for example) means that gardening does not need to be an elite leisure activity. Here's a great link to the potential of rooftop spaces as spaces of food production. When one enters New York city, the first thing one sees is the Bronx-- seemingly never-ending high rise buildings in the polluted haze that's the result of being a main corridor into Manhattan for ever type of truck and commuter. I wonder what it would be like to have good, fresh food growing in accessible places in the Bronx?